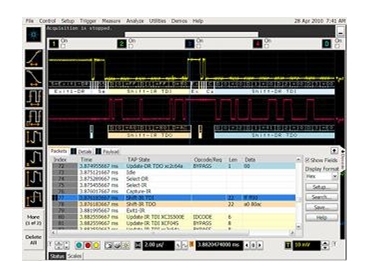 Agilent Technologies has expanded its Infiniium oscilloscope application portfolio with a Joint Test Action Group (JTAG) protocol decode and triggering application. Agilent's Infiniium Series is the first oscilloscope family to support JTAG triggering and protocol decode. Until now, when development teams needed to get JTAG visibility at the protocol layer, they had to take physical-level measurements and manually decode the JTAG signals, which was a time-consuming and error-prone process. The N8817A JTAG decode application performs the decode in real time, enabling teams to develop higher-quality products more quickly. JTAG, an industry standard also known as IEEE 1149.1, is used on virtually all printed circuit boards and integrated circuits manufactured today. JTAG scan chains are used extensively for manufacturing tests and for communication with IC subsystems. Often, JTAG is the only interface to these subsystems and correct JTAG operation is critical to device development. Electronic design and test teams in almost all electronics industries including the computer, communications, semiconductor, aerospace/ defence, automotive and wireless industries continue to produce increasingly sophisticated hardware designs. Oscilloscopes are the primary tool that engineers use to test and debug their designs, and increasingly broad measurement capability is critical for engineers to deliver robust products on time. To provide easily understood JTAG protocol on chains with multiple devices, the application imports critical information contained in industry-standard BSDL (boundary scan description language) files. The application provides real-time, at-speed protocol decode and flags error conditions. The N8817A JTAG decode application is supported on Agilent's Infiniium 9000, 90000 and 90000 X-Series oscilloscopes. The Infiniium 90000 X-Series oscilloscope family includes the fastest real-time oscilloscopes with real-time bandwidth of 32 GHz. These new scopes deliver the lowest noise and have the lowest jitter measurement floor ensuring superior measurement accuracy.